4 students from Purdue University joined us as interns at Shangri-La Hotel, Nanjing. It is now half way through their 6-month internship and we did an interview with them. Let’s find out how their foreign experience is in China! Today, we have Evan, who came to learn to be an event planner. What is the most valuable thing that you learned through this internship? When it comes to my experience at the Shangri-La Hotel, Nanjing, it has been quite a journey. I have developed as a better person more than I could have imagined through this opportunity to work in China. Some of the things that I learned are invaluable lessons along with technical know-hows. I have learned all of the steps necessary in order to plan an event, such as a wine dinner. Working with all people involved and coordinating the event from conception to the finish is very rewarding. I have also learned more about the Chinese culture that I have never heard about. Most importantly, I have developed a deep respect towards the Chinese culture through different experiences and lessons. How has this internship impacted your future career path? This internship has impacted my future career path very much. Now, I know that I like working internationally and would truly love to have the opportunity to come back to China. It is an amazingly beautiful and vibrant country that I would like to call home at some point in my life. How did you overcome the difficulties you face in China? Whenever you put yourself into a new environment, there are always challenges, especially when it comes to working in another country. I faced challenges during my stay and they have all been overcome. The tools that are essential are patience and understanding. What is your most memorable moment at Shangri-La so far? The most memorable experience that I have had at the Shangri-La are too much to just narrow down to one. The opportunity to be here will be something that I will never forget. To take part in planning and executing private dinners, such as V.I.P dinners, wine dinners, and our cognac dinner for the Flame on 40 Steakhouse, have truly been amazing for me. To meet everyone and befriend with them have been very special as well. Also, it is my pleasure to be a part of this internship program, and be a part of such a fine and elegant hotel. 4 students from Purdue University joined us as interns at Shangri-La Hotel, Nanjing. It is now half way through their 6-month internship and we did an interview with them. Let’s find out how their foreign experience is in China! Jamiel already had 5 years to F&B experience in the United States and we are eager to tell how could this internship help him further achieve his goal. What is the most valuable skills that you learned through this internship? In this internship in China, it is my duty to apply myself and do all I can in any situation, but I do not speak the language, and cannot read Chinese. To better equip myself, I have picked up a decent amount of Mandarin vocabulary while chatting with colleagues from different departments. For the service part, managers always reminded me that guests must be taken extra care of from the second they arrive in Nanjing to the minute they leave our hotel. This internship is massive for my personal growth and my professional development. First, I became braver to live in another country for 6 months, and to work full time while taking classes – such a busy life. Second, I am very glad I was stationed in China because I could explore more about the country . China it is becoming more integrated with the world economy and getting closer to America in the business aspect. Third, I am pleased to be connected with such a respected international hotel chain, Shangri-La, that I could understand more about work ethic. My family and I will be very proud of these accomplishments. Have you encountered difficulties working with people from different cultural backgrounds? Working in the Jin Bar, there are many times when we were very busy, especially when waves of guests coming to order drinks on Tuesday Salsa nights. When the majority of the Chinese crowd realized I could not speak Chinese, they ignored me and went straight to the other bartenders. I felt like I was not serving the guests and made the job much harder for the other colleagues. However, I used this opportunity to take care of other inventory issues, and to clean up. I also assisted the foreign guests and made them feel like home. There were a few foreign guests in the bar who added my WeChat. They then came back to enjoy again at the Jin Bar and thanked me for the service I provided. Another difficulty was that the POS (Point of Sale) software is predominantly Chinese. When working in our Lobby Lounge, guests might want to make an order or pay their bill, then I had to get a colleague to assist me. When we were busy, this is very inconvenient. I tried my best to help out more in other aspects, for example, preparing utensils, or grabbing drinks from the kitchens once the colleagues told me what the guests had ordered. I also quickly to cleaned the table once the guests had left. The ultimate difficulty is answering the phone, which is a tough one and I am still finding a way to solve it. The trip to XuYi during the LongXia festival was amazing. Being part of the Delegation between the state of Indiana and XuYi was such a great experience. Last but not least, the people I have met, and connections I have made here impacted my life, and I am sure I have made some life-long friends here! I have to thank Dr. Cai from the Purdue University, and Shangri-La Hotel for giving me this brilliant experience. Being brought up in the States, Grace was not very familiarized with the Chinese culture. Guess how did she resolve the difficulties in the Horizon Club. The Horizon Club Lounge was the first place that I stationed at. Here, I learned to multi-task efficiently and to be patient when facing difficult situations. One time, my colleagues and I were really busy with taking drink orders and checking in guests, so we decided to split our work. The one who was more familiar with the OPERA system focused on guest check-ins, while the others focus solely on seating and serving guests refreshments. After this experience, I realized how important team spirit is. Another valuable experience is that I learned not to reject the guests at once if I could not satisfy their request. Instead, I could be flexible to offer another option that is similar to their request so I would not disappoint them. The three months here at Shangri-La Hotel, Nanjing have further confirmed my determination to stay in the hotel and hospitality industry. Even though the hotel business could be tough and extremely tiresome, I have experienced so much positive feedback from the guests that I have served, and I think it definitely worth the hard work and time that I put in. Seeing smiles on the faces of guests is a very great feeling, I would always use those positive feedback as my motivation to work harder and be a better worker. And the better I do; the more good feedback will I receive, which becomes a positive cycle. One main difficulty that I experience is that I am often expected to act like a local due to my Chinese blood. I do speak Mandarin, which is very helpful in communicating with the guests, but it is because of so, I was often expected to hold knowledge of Chinese culture that I have actually never even been exposed to. Also, sometimes I could not understand the guests’ request because they only speak their dialect, not Mandarin. In this case, I would seek help from my colleagues. My most memorable moment at Shangri-La so far is that I used my multi-lingual skills to resolve confusion between guests and my colleagues, or to simply chat with the guests. I speak conversational Spanish and Japanese, so when I was able to lead a group of Hispanic guests as the Guest Relations Officer, I felt very proud of myself and I was really glad that I continued my studies in foreign languages. I hope such great experience would happen again soon during my internship here in Nanjing. Here comes our Berthing Attendant, Danny, who has been working at Aberdeen Marina Club for 7 years. Every day, he brings our guests for marine tour by driving the “Marina Pearl” and other speedboats. He also operates a very large yellow machine, called the crane! Though all these sound like one-man work, he said that communication and teamwork are still the most important elements to be successful. 4 students from Purdue University joined us as interns at Shangri-La Hotel, Nanjing. It is now half way through their 6-month internship and we did an interview with them. Let’s find out how their foreign experience is in China! First, we have Katie, working in the Front Office. In the past three months, I learned a lot of new things. The most important thing is to be extra patient. Since I am in a foreign country with huge language barrier, it is harder to understand what others are talking about, and it takes time to get things done. Also, I have learned that it is more complicated to run a hotel than what you could imagine. I took initiative to help out even when it was out of my scope of work. Through this, I became more resourceful and paid attention to every detail as well. Being here for just three months has greatly affected my mind more than anything did in the past. My horizon has been opened to a completely new culture, language, and way of doing things. What’s more – I have fallen in love with the Chinese culture! After this foreign working experience, I will most likely be working out of the States after graduation. I believe that putting myself in a completely new environment can truly make me grow as a person, and learn more than I could learn inside my comfort zone. I can proudly say that I have learned a lot in these past three months about the hospitality industry operations, culture, history and languages, as well as myself, than before. Before arriving China, I was told that it would not be easy because I would end up having culture shock. However, it did not stop me at all because I had the confidence to all difficulties. Luckily, I did not have much issue adapting to the culture with the help of my classmates and colleagues. I learned to be more flexible when working with different people. And now, there is nothing I could not manage. The very first memory is, in the first week that 4 of us (interns) worked with the Human Resources Department and walked around the hotel to show appreciation to different departments. It was awesome to take part in this campaign and I learned how to care about the employees. The second memory I picked to share is, being able not to only work with the colleagues, but also to become friends with them. We hanged out together after work! 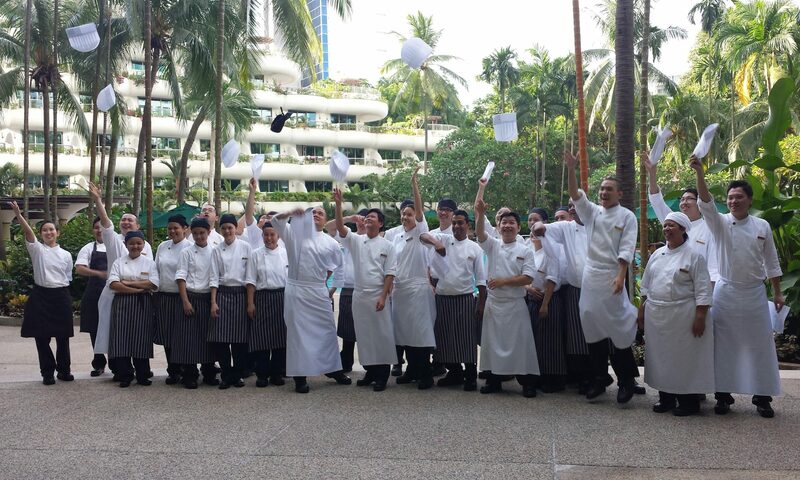 Shangri-La is not just a place for work but it is also a family as well! Lastly, it is when all of us from the Front Office got to bond on the 5th floor bar terrace for employee gathering. The managers were beyond hospitable and invited some long-stay guests to join us. I think it is very amazing how truly genuine, loving, and caring each person in the hotel can be. Working as an intern here has been an incredible opportunity and I cannot wait to see what I will encounter in the next three months.